Clean Energy Promotion through Microfinance in Ethiopia (CEPM Ethiopia) initiates an innovative and replicable mechanism to finance clean energy technologies (CET) for households and micro, small and middle size enterprises (MSMEs) through a microcredit financing mechanism. During the 30 months of the project (2014-2017), a business concept is established for three Ethiopian microfinance institutions (MFIs), with a total outreach of more than 130,000 clients. Through the technical assistance provided by Gaia Consulting Oy, MicroEnergy International (MEI) and Swan Management Plc, the MFIs are enabled to enlarge their portfolio with financial products supplying clients with improved and clean energy solutions. The project is financed by Nordic Climate Facility, an initiative funded by Nordic Development Fund and administrated by NEFCO and the project partners, thus multilateral performance-based climate finance is used to create a scalable and sustainable business mechanism, with the aim of improving energy access among low-income households and MSMEs in Ethiopia. Low-income populations in Ethiopia still rely on fuelwood as well as livestock and agricultural waste as the main energy source for cooking. In addition, the large majority of the rural and peri-urban population has no access to the electricity grid and relies on expensive, carbon-intensive and low-quality sources of electricity. Thus, high demand for climate-compatible energy systems, including improved cooking stoves (ICS), solar home systems (SHS) and photovoltaic (PV) lamps, among others, has been identified. However, the upfront costs of such technologies, as well as the lack of a well-functioning supply chain covering rural and peri-urban areas, represent a bottleneck to the dissemination of CET across low-income populations. All this considered, the project develops the entire supply chain for high-quality, clean energy technologies for low-income markets and puts in place an innovative business mechanism which enables the Base of the Pyramid to have access to these technologies. To achieve this, appropriate CET and providers have been selected, credit products designed and microloan products offered - including post-sales services and monitoring -, as well as strategic and operational business integrated. In addition, the project trains the microfinance institutions and clean energy technology providers in the execution of the new credit mechanism to ensure a successful implementation of the green credit scheme and its sustainability over time. CEPM Ethiopia aims to directly enable 130,000 MFI clients (of which 82,000 are women) to access CET by removing the initial technology affordability barrier through the establishment of an economically, environmentally and socially sustainable business mechanism for CET dissemination through microfinance. By providing incentives to rural and peri-urban low-income microenterprises and households to use the CETs (e.g. to repay microloan through improved income-generating activities and fuel savings), the project aims to achieve wide-spread sustainable use and reliance on CET over time. Energy poverty is a major structural challenge in Ethiopia inhibiting economic development and poverty alleviation. On a global scale, Ethiopia has the lowest access to modern fuels for cooking, per capita residential electricity consumption, and commercial energy use. Indoor air pollution (IAP), health-related risks during fuel collection and usage, high rate of withdrawn from school and nonattendance – especially among girls -, as well as high share of time and finances spent into fuel collection and usage are only few of the negative effects of structural energy poverty. 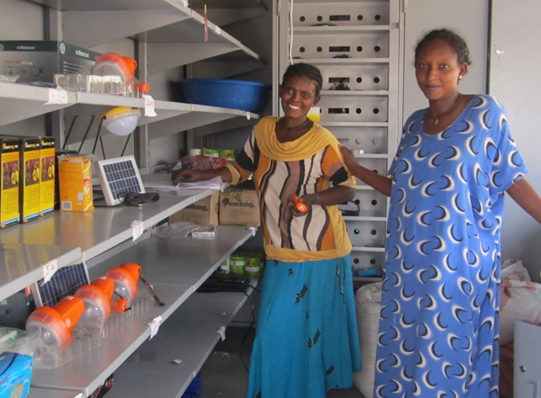 Therefore, CEPM Ethiopia aims to raise living standards through improving the access of low-income households and microenterprises to reliable, affordable, and sustainable energy products and services. By promoting products such as ICS and solar lighting the project helps decrease health risks by replacing harmful energy sources. In addition, the project promotes gender equality through enabling access to CET to over 80,000 women: this saves them time by having to collect less fuel wood, exposes them to less smoke and fine particles and improves their well-being through new income-generating opportunities. - The project partners follow a triple bottom line approach, thereby jointly addressing economic, social and ecological objectives. By combining financial and energy inclusion, local development is promoted in a sustainable manner, carbon emissions are offset, and public health is improved. - The number of Ethiopians using microfinance services is constantly increasing, thereby making the Ethiopian microfinance sector one of the world’s fastest growing microfinance markets. - The project establishes an operating model for the promotion of clean energy that links microfinance with energy providers, while targeting the energy needs and preferences of CET end-users. - CEPM Ethiopia combines extensive experience in sustainable business and low-carbon development, green microfinance and decentralized energy systems from project partners based in Ethiopia, Finland and Germany. Gaia and MicroEnergy International – with a strong expertise in green microfinance, decentralized energy systems and innovative models for climate-compatible development - contribute to the project through their business model development expertise, ability to recognise the potential and bottlenecks related to the CET markets, as well as to establish and maintain strong partnerships with stakeholders while designing well-functioning microcredit business mechanisms. The local MFIs contribute to the project through their extensive expertise in financing models for low-income clients in rural areas, their long history of successfully providing microfinance for women as well as intimate knowledge of their clients and their financing needs. - The capacity of the participating MFIs is strengthened in design of green credit products and product offerings – including selection of appropriate CET and technology providers and designing post-sales services and credit scheme monitoring -, as well as communication and awareness raising. Ethiopia’s dependency on rain-fed agriculture and biomass fuels makes it extremely vulnerable to the effects of climate change. The country is already suffering from changes in rain patterns and increasing and prolonged draughts caused by climate change. A World Bank study estimated that climate change can potentially reduce Ethiopia’s GDP growth between 0.5 and 2.5% each year if no actions are taken to strengthen the climate resilience of the country . At the same time the country has been a forerunner among developing countries in setting ambitious and comprehensive climate and development targets (CRGE 2008-2030) and was also the first LDC to submit its Intended Nationally Determined Contributions (INDCs) to the UNFCCC in May 2015. Ethiopia is committed to curb its greenhouse gas emissions between now and 2030 whilst aiming to be a lower middle-income country by 2025 (GTP 2, 2016-2020). Expanding access to renewable energy is one of the pillars in these Ethiopian strategic documents. By making CET available to hundreds of thousands of people who cannot afford emission reducing technology on regular commercial basis, the project contributes to the country’s emission reduction priorities and voluntary international climate change mitigation commitments. The project directly contributes to the national goals set forth in the Ethiopian INDC including the need to expand electric power generation from solar sources as an adaptation measure, in order to minimize the adverse effects of droughts on predominantly hydroelectric energy sector in Ethiopia. By offering competitive microfinance packages, the project is also aligned with Ethiopia’s Climate Resilient Green Economy (CRGE, 2008-2030) strategy as well as with the Ethiopian 2010 NAMA, which envisions that millions of CET will be installed across the country through technology specific projects. The business concept promoted through the CEPM can be extended to other MFIs in Ethiopia as well as to other developing markets with similar needs and characteristics, thereby creating a potential customer base of tens of millions of people in areas with poor energy access and lack of financial resources. The current client base of the three MFIs of 130,000 clients, representing about 5% of total Ethiopian MFI clients, is expected to increase significantly throughout and beyond the project. The participating MFIs and respective CET providers receive extensive training and capacity building in order to enable both MFIs and CET provider to increase outreach continuously by targeting new markets. It is expected that the MFIs will at least double the number of CET to be financed within 5 years after project finalization and will further invest in the development and execution of the CET microcredit business and own their business strategy. The market development of MFIs in Ethiopia has shown remarkable growth with 30 operational MFIs servicing over 2.6 million borrowing clients and significant perceptual increase in MFI clients of 53% since 2007 . Furthermore, a huge untapped target market of up to 70 million Ethiopians without access to electricity is a reason for other MFIs to replicate this business model. A channel through which the business concept can be shared with other MFIs in Ethiopia are MFI networks such as the “Association of Ethiopian Microfinance Institutions” (AEMFI). Based on international experiences with similar projects it is feasible to estimate that three additional MFIs will replicate the approach within a timeframe of 10 years after project finalization. Assuming an average portfolio size of around 90.000 borrowers and a portfolio penetration of 10% after 5 years of product introduction, this will amount to 27.000 new clients of CET of the additional MFIs resulting in overall impact of 190.000 Ethiopians.